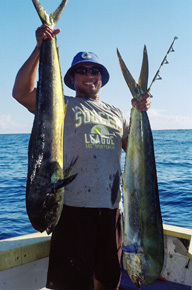 Fishing Getaways is a fishing holiday specialist that caters to a wide audience with charters to suit any skill level. 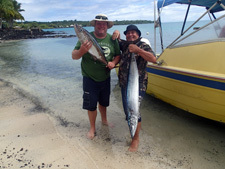 Located only 5 hours flying time from australia, samoa presents a variety of fishing opportunities for your trip suiting all budgets. Beside marlins being on the capture list, one of our latest trips landed 17 different species. The species list includes sailfish, mahi mahi, wahoo, spanish mackerel, giant trevally, barracuda, yellowfin tuna, coral trout and many more. the virginal waters combined with the rich local culture and warm hospitality makes each visitor feel as though they have discovered an untouched paradise. You will arrive as a stranger to this little known land, but by the time you depart you will feel as though you have become part of the family. 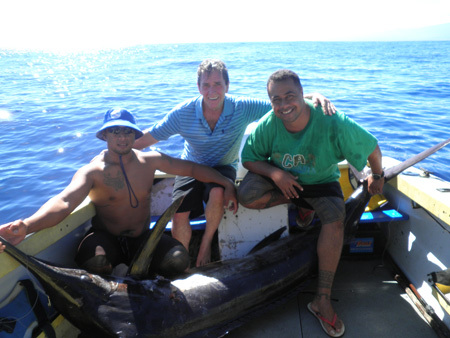 4 full days fishing on our 9 metre game boat out the southern side of Upolu before returning to the jetty of Sinalei for a cold beer.